Order ‘One Day Soon’ shirts by sending and email to iankamaumerch@gmail.com with your size, style (male crew-neck or female v-neck) and colour (black on black or red on white) $25 plus $5 shipping. CLICK HERE to order the album (digital or physical copies). 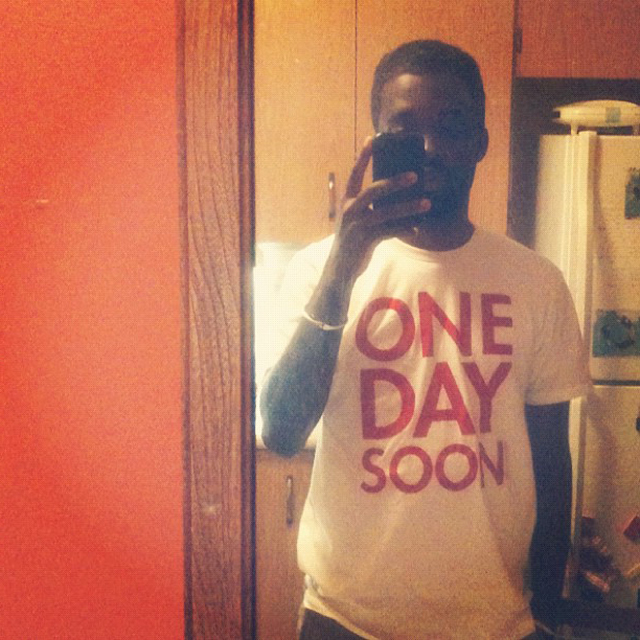 THE STORY: I had a few shirts made up for myself in the fall, one of them simply said “One Day Soon” the title of my most recent album. I did a show for Canadian Music Week that was curated my Shad and decided to wear it that evening. After the show two people, a guy and a girl, came up to me and asked if I had shirts to sell. I told them that I had just got it made up for myself and we spoke about the idea of ‘One Day Soon’ being about hope and asked them if I made some would they purchase them; they said yes. I decided to put the question out to a few more people, “if I made these shirts.. would you want one?” and within 48hrs had about 50 orders. I called my friend Javid; an artist and architecture student who started a social screen-printing and mural business called Under The Radar out of the youth space (The Loft) at Christie-Ossington Neighbourhood Centre in downtown Toronto, and asked if he could screen print the shirts for me. This is the video of his process (which I’ve never seen before).